A life lived selfishly, corruptly or filled with hate is a life that is useless, shrivels up and dies, Pope Francis said in a morning homily on Friday. Source: CNS. On the other hand, life has meaning and value “only in giving it in love, in truth, in giving it to others in daily life, in the family,” he said at morning Mass in the chapel of his residence, the Domus Sanctae Marthae. 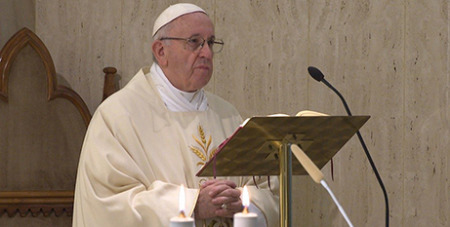 In his homily, the Pope reflected on the four individuals in the day’s Gospel reading from St Mark (6:14-29): King Herod; his brother’s wife, Herodias; her daughter, Salome; and St John the Baptist. Those responsible for St John the Baptist’s death, however, were either tricked or inspired by the devil, he said. John the Baptist was killed on the whim of a “conceited dancer” and because of “the hatred of a diabolical woman and the corruption of an ambivalent king,” the Pope said.